MEXICO CITY (CNS) — Nicaragua’s bishops have suspended their participation as mediators and witnesses in a national dialogue, citing a “lack of consensus among the parties” on resolving the political crisis engulfing the Central American country. The bishops announced the suspension of talks May 23 and said a six-person commission would continue to seek a solution, even as protests engulf the country and police and paramilitary groups attack civilians, who are demanding democracy and opposing what they consider authoritarian rule by President Daniel Ortega. 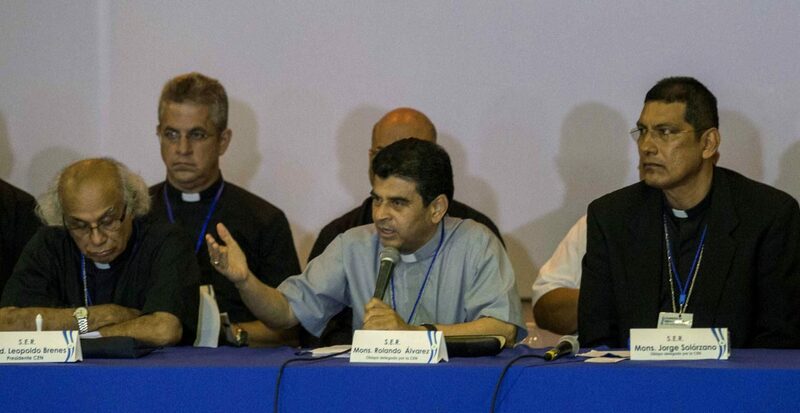 “As pastors of the Catholic Church, in service to the truth, fellowship and justice, we feel the need to remind (people) that the peace of our country and the lives of many Nicaraguans depends on this decision and the possibility of continuing this dialogue,” the bishops’ mediation and witness commission said in a May 23 statement. Unrest broke out in Nicaragua after the Ortega government tried to reform the country’s social security system and increase fees, amid accusations of corruption and mismanagement. Protests, especially among students, have continued as the government cracks down on dissent and puts restrictions on the media. The country’s bishops have tried to mediate a solution to the crisis and convened the national dialogue. Representatives of the Civic Alliance for Justice and Democracy, which includes groups opposed to the government, proposed reforming Nicaragua’s political system, holding early elections and creating an international commission to investigate the violence occurring in the country.